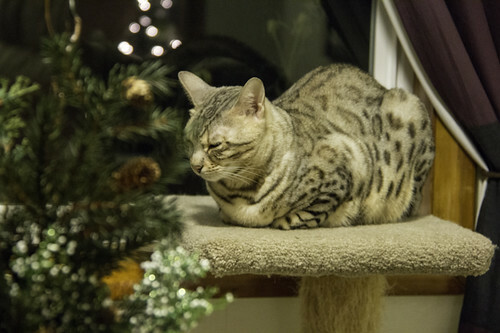 Rambunctious Rosettes: A Tale of Two Bengals: Meowy Christmas! My apologies for the long absence of posts. I've been doing a post-bacc program along with my full time job and blog posting fell off my priority list for awhile. 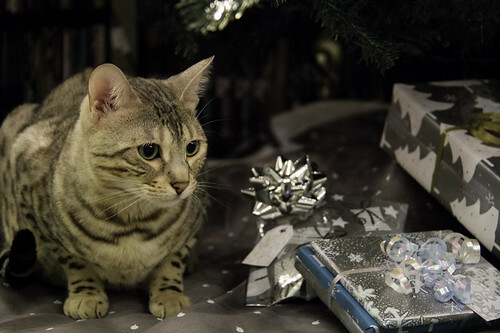 But the girls are back to wish you a very meowy - err - merry Christmas! 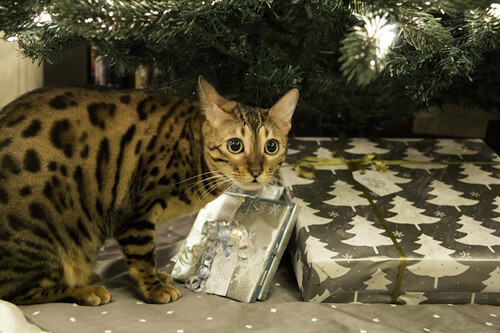 The girls were very helpful when it came to present wrapping, of course. Always wanting to be involved. Especially Mika. 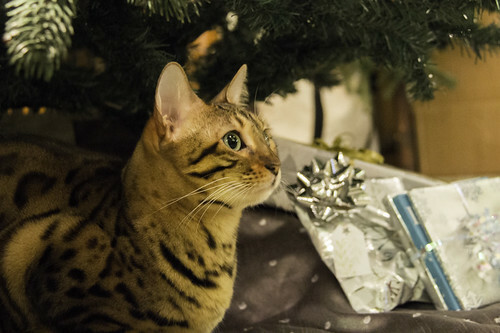 Mika is also very into present UNwrapping. Hard to resist those shiny ribbons! This is her caught-in-the-act guilty face. 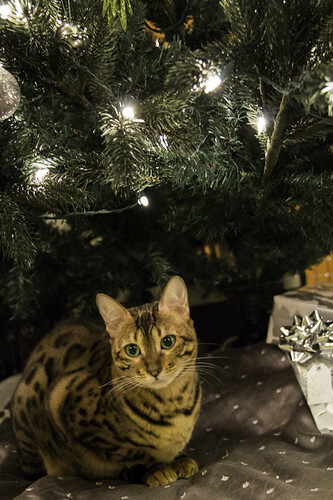 Mika's more usual position by the tree. Always the same spot. 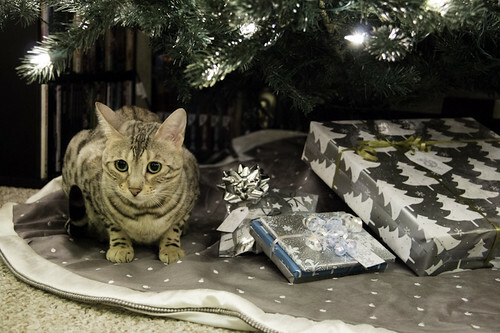 These were taken at the beginning of the month, so there are actually a lot more presents under there now, but she still chooses that particular spot as her favorite. Look at that kitty smile. 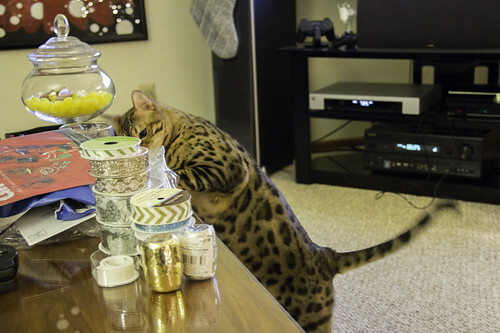 Such a happy bengal. 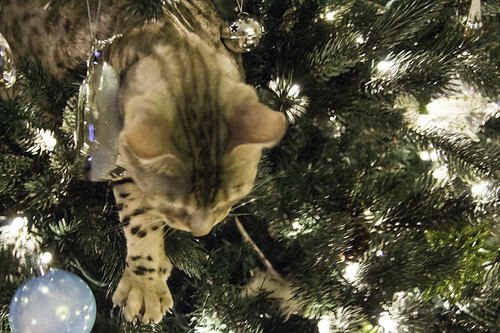 Mochi is also a fan of the tree, though she spends more time in it than under it. Then she likes to shoot out of the middle of it and onto the ground. 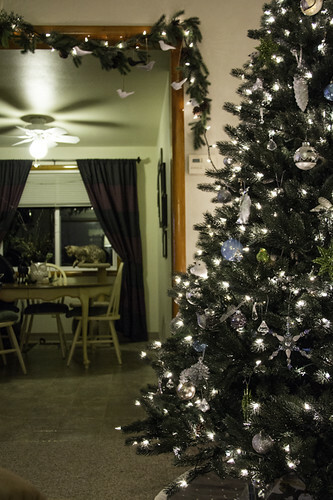 Fortunately no ornaments have broken in this routine. I don't have any more pictures of that naughty behavior though it happens at least once a day. There's a good Mochi cat. Sleepy and on her tower, just where she should be.